41 pages with card stock cover. 3 5/8 x 6 1/4 inches. Lists parts and gives illustrations.It also has the luggage carrier and Tandem attachment. 52 pages printed on glossy paper with card stock cover.5 x 7 inches. Lists all parts and illustrates most of them. 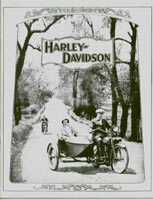 24 pages printed on glossy paper with a glossy card stock cover.6 7/8 x 10 1/2 inches.Gives mechanical descriptions and the side car specifications.Nice center page illustration of the Two-speed Twin model 10-F.
56 pages printed on glossy paper with a card stock cover.6 x 9 inches.All parts are listed and most are illustrated. 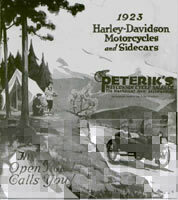 33 pages printed on glossy paper with a heavier stock glossy cover.6 1/2 x 10 inches.About models 17-F,17-J,17-C,17-E,17-B,Sidecar 17-L,Sidevan 17-M and17-N.Nice center page illustration of the Three-speed 17-J. Over 215 headings with practical information and advice. 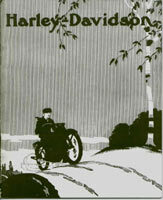 Printed on glossy paper.About models 17-F,17-J,17-C,17-E,17-B,Sidecar and Sidevan 17-L,17-M and 17-N.
Card stock cover with glossy paper.88 pages,6 x 9 inches.Motorcycles and sidecars.Contains detailed illustrations and listings of spare parts for Three-speed V-twin cylinder models 1917 to 1923 and sidecars 1915 to 1923. 8 3/4 x 11 3/4 inches.About model 18-J with a left and right hand illustration.Also about models 18-F,18-C,18-L Sidecar and 18-M Parcel car.Printed on glossy paper. 96 pages with card stock cover.6x9 inches.Over 210 headings from battery care to valve grinding. 40 pages with a card stock cover.6x9 inches. 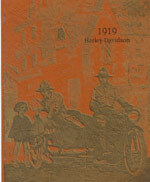 Nice illustrations and photos.32 pages printed on glossy paper.Covers all 1920 models. 102 pages printed on glossy paper with cardstock cover.Includes trouble shooting chart and fold-out left and right side lube chart. 24 pages with card stock cover.Covers V-twins only. 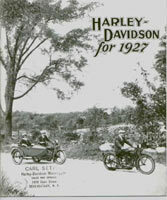 12 pages printed on glossy paper.Illustrates all 1922 twin models. 12 pages printed on glossy paper.Nice illustrations and old photos. 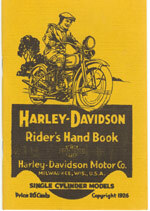 To be used with 1927 or 1929 rider`s handbook.Electrical diagrams and illustrations. 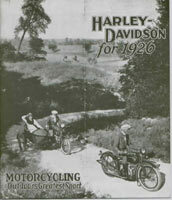 14 pages printed on glossy paper.Covers all 1925 V-twins and sidecars. Gives operation instructions and genaral maintenance procedures. 68 Pages printed on glossy paper. 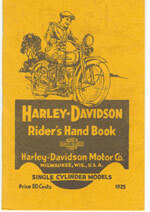 Fold-out lube chart showing left and right hand sides. Covers Singles,Twins and sidecars.Nice collage of pictures on the inside covers. Covers all models.Nice pictures on the inside cover. Tells about the specifications and advantages of the single models.